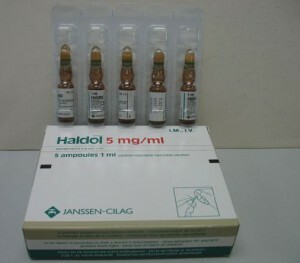 Common side effects of Haldol (Haloperidol) include nausea, mood changes, hallucinations, immovable facial expressions, vomiting, increased saliva, back pain, breast pain and difficulty falling asleep. Other side effects include confusion, lack of thirst, anxiety and muscle tics. Psychotic disorders that are treated with Haldol are often those in which the patient has difficult distinguishing between what is real and what is imaginary. Many of the above side effects can be eradicated with an adjustment to the dosage prescribed by your doctor. In case of an overdose, call your local Poison Control Center immediately. One major way of avoiding side effects is by making certain that you do not share your injection pen with anyone else – this ensures that you are not opening you body up to blood-born pathogens that could cause a serious infection. Any of these side effects can be indicative of an underlying health issue. With this in mind, be sure to contact your healthcare professional immediately if you experience any of the above symptoms, especially if they are continually persistent or unusually severe. Failure to do so can result in permanent injury or even death. If you have ever suffered from Parkinson’s disease you should inform your doctor - he or she would probably tell you to cease taking Haldol. Breast cancer, depression, ammonia build-up in the blood, seizures, and thyroid disease are all indicative factors that would inhibit the use of Haldol, as well. Impairment can also occur indirectly by experiencing some of the thought-inhibiting side effects of the drug. One of the common side effects that have been cited is drowsy movement and clouded thoughts. For this reason, driving a car is extremely unsafe until you are certain of how Haldol will affect you. The side effects of Haldol also affect the elderly in a variety of different ways. Haldol is often used in the treatment of dementia for the elderly and is known to cause abrupt changes in mood and personality. It is has also been reported to disrupt their ability to think clearly, communicate, and perform daily tasks. In addition, they have been reported to carry the risk of an increased chance of death. It is important to note that the FDA does not approve the use of Haloperidol in the case of any behavioral problems. Haldol has been used to effectively treat millions of patients suffering from psychotic disorders. However, as with any drug, there are certain side effects that need to be considered whilst using the drug. If any of the side effects mentioned above are experienced, speak with your doctor immediately.